Want to get that blues sound in your own piano playing? The blues is a style of music all its own. Heck, it even has its own scale. Here, you don’t apply the blues style to an existing song, but rather create your own blues from scratch. That’s right: You get to be a composer. Whether your dog left you or your boss has done you wrong, playing the blues is as easy as counting to 12. Two important elements in the blues are form and rhythm. When you have these down, add a few more essential elements, like grace notes or tremolos. Then you can make any of your songs sing the blues. 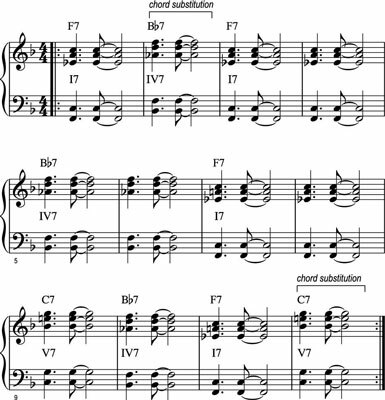 Most blues uses a widely recognized structure called the 12-bar form, aptly named because each musical phrase of the song is 12 measures long. 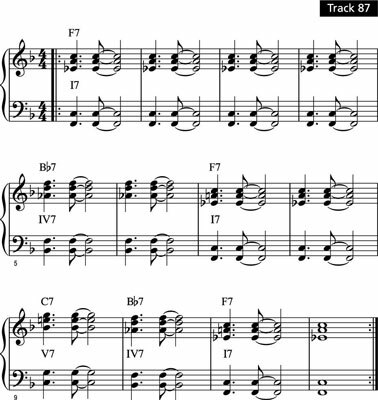 The 12-bar blues has a chord sequence that repeats over and over, usually with different lyrics and perhaps some melodic variation, until you genuinely feel sorry for the storyteller. These three chords appear in the same order and for the same number of measures every time the 12-bar phrase is repeated. To play your own 12-bar blues, just follow these easy instructions, playing with either hand or both hands. When you have the chord progression memorized, try playing the chords with the left hand while your right hand plays a simple melody, riff, or blues scale. Play a I7 chord for four measures. Play a IV7 chord for two measures. Play a I7 chord for two measures. Play a V7 chord for one measure. Play a IV7 chord for one measure. Repeat Steps 1 through 6 until you have your audience singing with you. Here’s an example of 12-bar blues that uses chords only. They may be just chords, but you should still play them with conviction. All blues players realize that the same chords over and over can become repetitive (to both audience and musician), so they substitute other chords within the 12-bar form. For example, try a IV7 chord in measure 2 and play a V7 chord in measure 12 as a turnaround. Check here to watch a blues piece with chord substitutions.